All good chefs know that the appearance and presentation of food is just as important as the flavor. If a steak is an unappetizing shade of gray, it will seldom be appreciated, even if it’s delicious. It’s the same with beer; a great deal of the perception and appreciation of beer comes from the way it looks. Everyone likes to see a sparkling, clear European pilsner, Oktoberfest, or pale ale, and even dark styles such as stout and porter look a lot better when they are clear black instead of muddy brown. Have you ever proudly poured a bottle of your favorite homebrew for a friend, only to find that chill haze has made the beer foggy and “yeasty” looking? At this point the homebrewer usually has to launch into an embarrassing explanation of how homebrew is different from commercial beer. We can explain how our beer is naturally fermented and unfiltered, but in the minds of most people, a hazy homebrew is still going to compare poorly with crystal-clear commercial beer. It’s not hard to make sparkling, clear beer once we understand what causes cloudiness in beer. Good brewing practices, combined with the correct use of the clarifiers that are available, will enable any homebrewer to make beer that is admired for its brilliance and clarity. Most beers are clear at room temperature. If there are haze-producing proteins and tannins (both primarily from malt) suspended in the beer, haze particles don’t form because of the warm temperature. When beer is chilled, these proteins and tannins react to clump into larger particles that are big enough to reflect light. The haze clumps are white, and while they are suspended in beer, they make the beer appear hazy or milky. The clumps are slightly heavier than beer, so if the beer is kept undisturbed at refrigerator temperature for a few weeks, it will become clear again as the protein settles to the bottom of the bottle. Major commercial breweries solve the haze problem very effectively using several methods. One is to chill the beer to very low temperatures (30.2° F or -1° C) prior to filtration — they give it a bad chill haze on purpose. Then the beer is run through a filter that removes both haze and yeast. Homebrewers can’t use this process if they want to use natural carbonation at bottling time, because natural carbonation requires the presence of live yeast. Brewers who are using a kegging system can cold-filter their beer, then artificially carbonate it by injecting CO2 gas. Beer that is filtered in this way will be crystal clear at any temperature, and there will be no yeast sediment. To make clear beer without filtering, the idea is to keep those haze particles from being present and suspended in the finished beer. There are lots of ways to do this, and it is best to use a combination of several techniques, all of which either remove proteins, tannins, or haze. A good start if you are mashing a grain beer is to take a protein rest between 113° and 140° F. At that temperature some haze-causing proteins are destroyed by enzymes, and many are made insoluble by reactions with other compounds in the mash. The most important practice in producing clear beer involves using heat and cold in just the right way to drop protein out of the wort. A good rule is to boil it as hard as you can, then chill it as quickly as you can. In the brewing kettle a good, rolling boil of about one hour will help the clarity of both all-grain and malt extract beers. A rolling boil makes the tannins and other compounds that form the hot-break material, or trub, collide with protein particles. A good rolling boil causes more protein and tannin removal than weak boils. After boiling there are still some proteins in solution. Much of the proteins form cold trub during chilling. Rapid and effective wort chilling, with a wort chiller, is a vital part of this process. When boiling wort is rapidly cooled, the trub forms large particles and drops to the bottom. This is called the cold break, and it drops a lot of protein out of solution. After chilling and a good cold break rest (for about two hours), the clear wort can be siphoned or poured into a primary fermenter, leaving cold trub and haze-forming compounds behind. Unfortunately, this effect is lost if the wort is cooled slowly. Many homebrewers let the boiling wort cool overnight in a sealed, sanitized container, then pitch yeast the next day. When this is done, the beer will always have a chill haze because the haze-forming compounds will have remained in solution. When used in combination with this boil-and-chill method, Irish moss is an important clarifier. Irish moss is a seaweed (chondrus crispus) that is harvested from the Atlantic, then dried and broken into flakes. The active ingredient in Irish moss is carrageen, which is used in many food products as well as in beer. Carrageen has a natural negative electrical charge, and the protein particles in boiling beer wort have a positive electrical charge. When they encounter each other in boiling beer wort, they stick together. And since the Irish moss is very heavy, it helps to drop these compounds out during wort chilling. One-half teaspoon of Irish moss should be added to every five-gallon batch of beer 15 minutes before the end of the boil. Avoid chill haze by serving beer around 55° F.
There are many other clarifiers available, such as bentonite, gelatin, isinglass, papain, and others. Each of these has its adherents, and they all work well in certain situations. These are properly called “finings,” as they are added to the beer in the secondary fermenter or at bottling. Gelatin works by combining with tannic acid present in the beer. These combined particles adhere to yeast and proteins, then sink. Add gelatin to the beer before you rack to bottles or keg, and make sure the solution is mixed well. A product made from cow and horse hooves, gelatin works most effectively in beer that is 50° F or colder. The closer the beer is to freezing, the better the gelatin will work. Isinglass is the fining traditionally used in British cask-conditioned ales. Derived from the swim bladder of the sturgeon, isinglass is prized for its ability to quickly settle ale yeast out of solution. Isinglass must be mixed in a mildly acidic solution to work in its traditional form. Homebrew shops sell isinglass in a prepared solution that can be added directly to the keg or bottling bucket. Papain is an enzyme that prevents haze by breaking down proteins. The downside is that this causes foam stability to suffer. Papain is derived from the papaya plant and can be found at some hombrew shops and specialty herb stores. Add a small amount to the bottling bucket. Polyvinyl polypyrrolidone (PVPP) is a powdered plastic that functions as an adsorbent. It physically attracts other compounds through static electricity. PVPP, best known under the brand name Polyclar, is popular among commercial brewers because like other adsorbents, it is quick and effective. Use PVPP in the secondary fermenter, not at bottling time. It’s best to rack the beer after the fining has finished its work. Other adsorbents include silica gel and bentonite, a ground clay that can be difficult to use because it can affect flavor and head retention. Each of these finings works by either dropping suspended protein or tannins out of the beer or by removing it entirely. I think these are certainly worth a try if you are so inclined. A lot of the fun of homebrewing is in coming up with your own methods and making them work. If you have a batch of beer that just won't clear, all is not lost. Use one of these fining agents. Beer clarity can be improved by adding various fining agents. 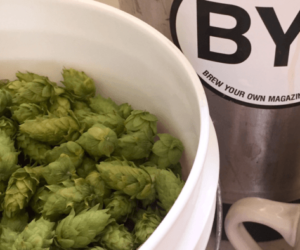 Two pros discuss their favorite fining agents for making lovely lagers and awesome ales.